What are TV screen sizes? If you ever tried to set up your TV space and wondered what is the right distance to watch TV, you should give this TV size calculator a look. It is a tool that, basing on the screen size and its resolution, chooses the optimal distance from the screen so that you can enjoy the best picture quality. This article covers the basic information, such as what TV resolution is, along with the assumptions made for the purpose of the calculator and an example of calculations. If you go shopping for a TV set, the different characteristics of each screen are bound to give you a headache. Each screen has some mysterious numbers describing it, and to top it off, some have these enigmatic "4K" or "Ultra HD" properties that don't mean anything to you. All of these terms are just measures of the screen resolution - number of pixels on the TV screen. A pixel is the smallest "dot" that can be accurately displayed on the screen. If you look really closely at your TV, you will discover that the lines are a bit jagged, because they consist of tiny squares. The size of pixels is determined by the screen resolution. The main assumption our TV size calculator is based on is that the human eye can correctly distinguish two things that are separated by an angular distance of 1/60 degree. That means that per each degree of our vision, there should be 60 pixels on the screen. If the resolution is lower and there are less than 60 pixels, we will say that the quality is not that great. On the other hand, if there are substantially more than 60 pixels per 1 degree, we won't notice it and appreciate the high quality of the screen. A TV screen size, always expressed in inches, is the length of a diagonal of a screen. For example, a 32" screen has a diagonal length of 32". If it has the regular aspect ratio of 16:9, then the sides of this screen are 27.9" and 15.7" respectively. If you want to calculate the optimal distance between you and the TV, you need to remember that one pixel should occupy approximately 1/60th of a degree of your vision range. The further you move away from the TV, the smaller angle it takes up. 60 pixels per degree mean about 32 degrees for a 1080p TV, and about 68 degrees for a 4K TV. Once you know this number, you need to calculate the width of your TV. Remembering that the aspect ratio is equal to 16:9, and knowing your screen's diagonal length, you can easily calculate the width of the screen. Then, all you have to do is apply some trigonometry. Let's denote the part of your vision angular range occupied by the TV with a symbol θ. If you draw your TV setup, you will notice that in fact, the tangent of θ/2 is equal to half of the screen's width divided by your distance to the screen. θ is the part of your angular vision occupied by the screen. Remember that the result will be optimal only from the point of view of the image quality. This calculator does not take into consideration any health issues. 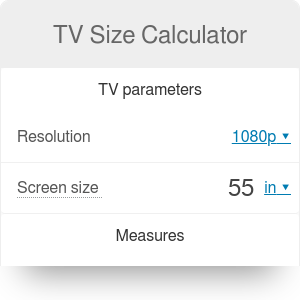 You can use our TV size calculator or find the unknown values by hand. Let's analyze the calculation process step by step, assuming you want to calculate what is the right distance to watch TV. Begin with measuring the TV screen size. Let's say it is 45". Decide on the resolution of your screen. Let's choose a regular screen with 1080p. Calculate the horizontal resolution of the screen. Knowing that the aspect ratio is 16 to 9 and the vertical resolution is equal to 1080p, the horizontal will be equal to 16/9 * 1080 = 1920p. Divide this result by 60 to obtain the angle θ: 1920 / 60 = 32°. Now, calculate the tangent of θ/2: tan(32°/2) = 0.287. Calculate the width of the screen. As the diagonal is 45" long, and the aspect ratio is 16:9, the width is equal to 16 / √(16² + 9²) * 45" = 39.22". That's it! The optimal distance from the TV is equal to 5.7 ft.
TV Size Calculator can be embedded on your website to enrich the content you wrote and make it easier for your visitors to understand your message.